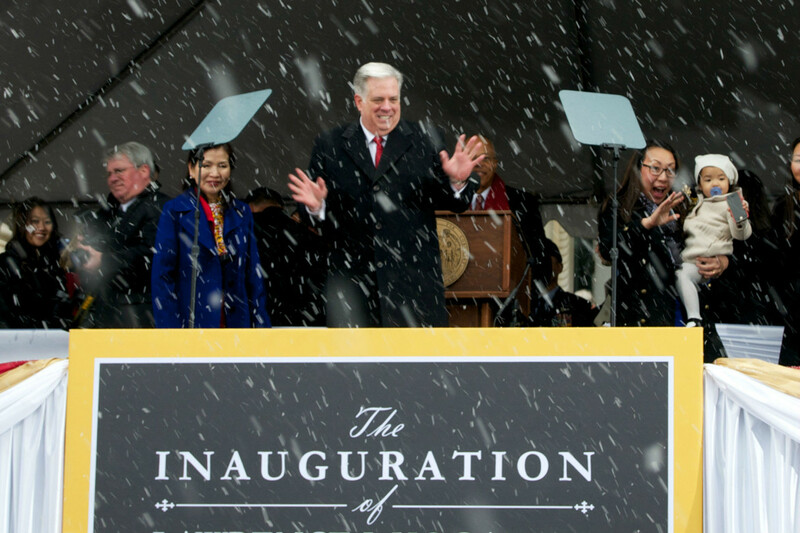 “They said it would be a cold day in hell when they elect a Republican governor,” Larry Hogan ad-libbed as he took the outdoor podium on a snowy day at the State House. Here are some photos from the day taken by Rebecca Lessner of MarylandReporter.com. The official swearing in of Gov. Larry Hogan Jr. (Lawrence J. Hogan Jr., as he was called today) actually took place in the Senate chamber, administered by Chief Judge Mary Ellen Barbera as wife Yumi Hogan held a bible. State troopers lined up under the rotunda of the State House awaiting the Hogans. The Hogans enter the State House escorted by the Maryland National Guard. Former Republican Gov. Bob Ehrlich offered welcoming remarks. Hogan’s staff and cabinet appointees had front section seats as the snow began to fall. Del, Wendell Beitzel and Sen. George Edwards of Garrett County are both used to the snow in far Western Maryland. Larry Hogan Sr., with cane, leaves the State House. His son gave him a shout-out, as usual, in the inaugural speech, for his role as Republican congressman voting for the impeachment of President Richard Nixon. It was an example of “doing the right thing” without regard to party. Hundreds of people stood in line to be greeted by Larry and Yumi Hogan and Lt. Gov. Boyd Rutherford and his wife Monica. under the rotunda of the State House.